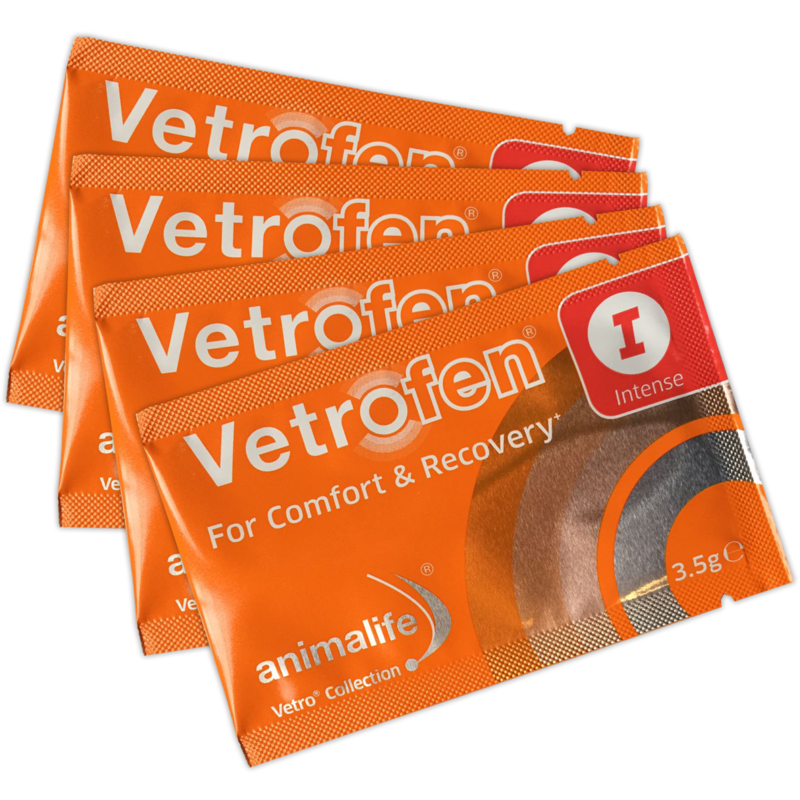 Animalife’s Vetrofen Intense 3.5g sachets are effective, fast-acting and convenient. They have been scientifically formulated to offer your horse support in dealing with intense activity or recovery from physical trauma. They are proven to be beneficial when given both before and after a strenuous workout to aid comfort and recovery. Vetrofen Intense stands out as a market leading joint supplement, as it contains Scutellaria baicalensis & Acacia catechu, formulated with the unique Specially Optimised Bioavailable Formula (SOBF) technology to ensure optimal absorption of the ingredients. Scutellaria baicalensis & Acacia catechu have been used for years in joint supplements for human medication, but are not yet included in many equine joint supplements. Studies in animals with arthritis, have shown that when these two ingredients are used in combination, they reduce joint pain & swelling. Vetrofen Intense is a palatable, fine brown/yellow powder that can be mixed into your horse’s daily feed. Vetrofen is a 100% natural, powerful antioxidant that’s fast-acting and safe, with no side-effects for either short-term or continuous use. It targets inflammatory response from bruising in just three hours, but is most effective after 6 – 12 hours. 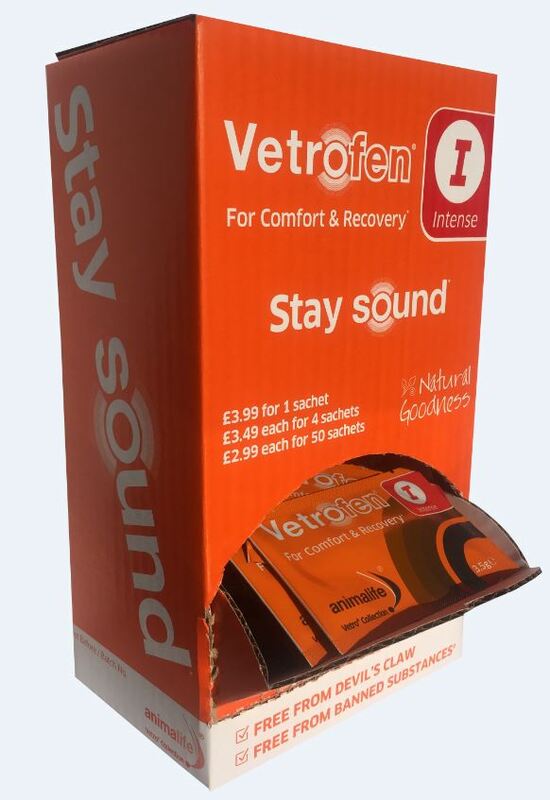 The benefits Vetrofen brings to the function, flexibility and comfort of the joints, ligaments, muscles and tendons – all of which, if compromised, can detract from health, wellbeing and performance – are second to none. It is the perfect support for veterinary or farrier visits, training sessions, roadwork, hillwork and competition days, plus its potent antioxidant qualities also make it the ideal support for short-term swelling and areas of inflammation. They are free from Devil’s Claw & safe to use with competition horses. 400kg - 600kg- Give 1 sachet of Vetrofen the night before & 1 sachet 2-3 hours before activity. 200kg - 300kg- Give half a sachet of Vetrofen the night before & half a sachet 2-3 hours before activity. Given after work, when Vetrofen can help with knocks, bumps and bruises, one sachet should be given immediately after exercise. 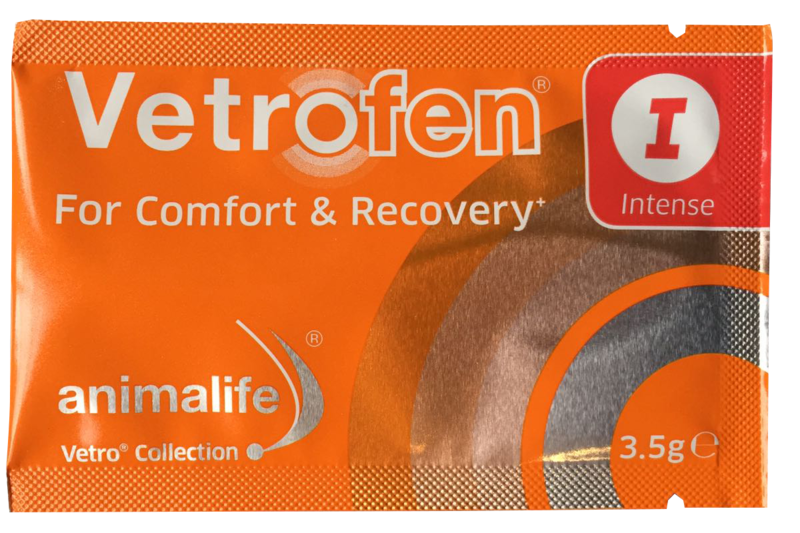 Vetrofen can also be used for recovery and/or as a boost. In this instance give one sachet immediately. For extra fast results or intense activity you can double the suggested serving for optimum performance.